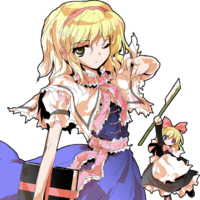 Alice Margatroid (アリス・マーガトロイド, Arisu Māgatoroido) is a doll-controlling magician who lives in her home in the Forest of Magic near the home of Marisa Kirisame. 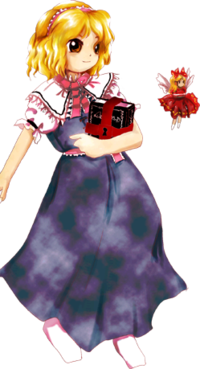 According to ZUN's comments in the Music Room of Perfect Cherry Blossom, Alice is kind of a special character in the Touhou Project. Alice made her first ever appearance in the fifth PC-98 Touhou Project game Mystic Square as the third stage boss and the Extra Stage boss. 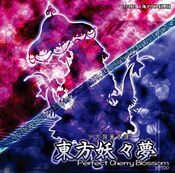 Afterwards, she appeared again as the third stage boss and midboss in the seventh game, Perfect Cherry Blossom, and as a playable character in Imperishable Night, along with being one of Marisa's choosable partners in Subterranean Animism. She was a playable character in Immaterial and Missing Power and Scarlet Weather Rhapsody and was the Final boss of Cirno's scenario in Touhou Hisoutensoku. Additionally, she was a target on Stage 3 of Shoot the Bullet and has made a background appearance in Hopeless Masquerade. She is a pure all-purpose-type magician youkai who lives in a western-style house in the Forest of Magic without strengths and weaknesses in attributes, but she fundamentally fights in style of manipulating her self-made dolls. She's largely indifferent towards other people and heavily attached to magic. She appears to be strong-willed, but is actually somewhat cowardly. In Mystic Square, she lived in Makai. Just like in her later appearances, she was portrayed as a doll-using magician. Later on, in the Extra Stage, she comes into possession of a grimoire, which (if it's the same one) she still carries around, albeit sealed. Makai was created by Shinki along with its native residents, but it's unknown if Alice is also one of them. 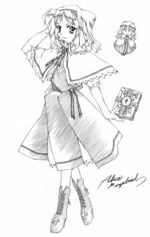 In her Imperishable Night profile, she is said to be a magician as a species, in contrast to Marisa, who is a human that practices magic. In Perfect Memento in Strict Sense, she is described as a former human who became a magician recently. It is also said that she still continues human habits like eating and sleeping, despite them not being necessary to her. In Mystic Square, Alice is implied to already be a youkai, as she refers to Reimu specifically as a "human". According to Perfect Memento in Strict Sense, she has a high understanding of humans, as she used to be one herself. Her threat level is stated as low, while her human friendship level is high. She gladly gives shelter to people lost in the Forest of Magic. She does, however, seem eerie to people who come across her - she isn't very eager for conversation and focuses entirely on magic research, making visitors flee near-immediately. She showed her hospitality in Immaterial and Missing Power, when she led Sakuya Izayoi out of the forest, as well as in Strange and Bright Nature Deity, where she let the Three Fairies of Light stay at her house. She doesn't perform the usual act of attacking humans, but she unexpectedly likes fights and gladly accepts any challenge. She's an indoors type who usually works alone, but in Perfect Memento in Strict Sense, the range of her place of activities is stated to be "any kind of place" in Gensokyo She performs her share of intermingling with the village, appearing in front of people in times of festivals to exhibit her skills with dolls, which are quite well-received. In each ending of Imperishable Night and Immaterial and Missing Power, she participated in banquets at the Hakurei Shrine. Just like Marisa Kirisame, she has an obsession with collecting things, especially magic items. Although this is an area that could be thought of as an area of commonality between them, there has not been a single depiction that would suggest that she had anything stolen from Marisa. 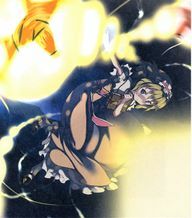 Alice Margatroid, as illustrated in The Grimoire of Marisa. Alice does not find it enjoyable to win battles with overwhelming power and is more interested in strategy, so she usually fights with power that is a little above that of the opponent and always holds back even if it means losing. She does this out of fear that if she were to be defeated using her true strength, she would have nothing to fall back on, which resembles Reimu Hakurei. It is unknown if this is fundamental to her personality, or if this is simply something she judged as an efficient strategy. She generally avoids those stronger than her, as shown in Immaterial and Missing Power. Alice with her dolls, as illustrated in Bohemian Archive in Japanese Red. Alice's dolls shovelling snow in Strange and Bright Nature Deity. Alice's dolls repairing a window in Strange and Bright Nature Deity. Her specialty is manipulating many dolls simultaneously. Due to this, her dexterity is among the finest in Gensokyo. She is able to make her dolls move pretty much in any way humans can, as well as make different dolls perform different actions at the same time, sometimes making them cooperate and sometimes making them move completely asynchronously. Due to this, it looks like she doesn't even manipulate them - for example, Marisa Kirisame commented that "she said that she controls all the dolls herself, but that sounds like a whopper". The dolls can themselves manipulate other dolls, as well. Alice insists on creating new dolls herself rather than letting the already made ones handle the task. She can move the dolls through spoken commands, as shown in chapter 5 of Strange and Bright Nature Deity. 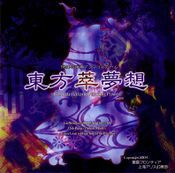 The dolls are shown to be capable of speech - such as in Imperishable Night's Prologue, Strange and Bright Nature Deity or MarisaA's ending in Subterranean Animism. According to her Perfect Memento in Strict Sense article, she hasn't yet succeeded in creating an independent doll, and a conversation between Marisa Kirisame and Rinnosuke Morichika in Curiosities of Lotus Asia chapter 16 suggests that Alice just controls the dolls and pretends they are alive for her own amusement. According to Bohemian Archive in Japanese Red, her objective is to make a completely autonomous doll that has its own thoughts and moves by its own volition. In Touhou Hisoutensoku, she unleashes a "Semi-Automaton" doll. However, in her post-battle conversation with Youmu Konpaku, she says that "the strings that attach the body and soul are the same as the ones that control dolls". If this is to be considered, then it could be that Alice controls the dolls with her own spirit. It is not explained if she needs to periodically give them magic power or if they are just fine without, and if they will move even if she does not give them any commands at all. In Touhou Hisoutensoku, Alice did say that "it seems that it's more convenient to control the dolls myself than have dolls that think on their own". Controlling them aside, she can also make her dolls explode, as shown in various spells. In Subterranean Animism, the dolls that she lent to Marisa Kirisame have been prepared with gunpowder. In Magic Sign "Artful Sacrifice" as well as the skills "Volatile Doll", "Doll Cremation" and so on, she is able to put in magic power into the dolls to make them explode. It's unclear what the relation or difference is between the dolls that use gunpowder and the dolls with magic power put into them. 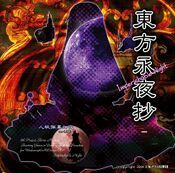 It seems that Alice can see through illusions - in Imperishable Night, she figured out Keine Kamishirasawa's true form and saw invisible rays of light coming down from the full moon. She also realized that Fujiwara no Mokou was not actually alive. Whether this is an actual ability of hers or just her being highly perceptive in general is unknown. Shanghai and Hourai are the two most well-known dolls (or types of doll, rather) used by Alice. The Goliath Doll is another doll created by Alice, which appears to still be in the testing stages and is thought to be her strongest doll. Alice always carries around a sealed grimoire. It is very likely to be the same grimoire she uses in Mystic Square's Extra Stage which contains the "ultimate magic". She uses it to cast color-based attacks. Strange and Bright Nature Deity says that Alice has a grimoire "shining with all the seven colors of the light", possibly referring to the same one (albeit she uses only five colors in Mystic Square). When the Three Fairies of Light mention coming into possession of the grimoire, Alice gets angry and nearly attacks them. Alice, as illustrated in Perfect Memento in Strict Sense. Her full name is Alice Margatroid (アリス・マーガトロイド). She had no surname in Mystic Square. Her surname, Margatroid, is derived from a real surname, Murgatroyd. The inspiration is most likely Miss Murgatroyd from Agatha Christie's book A Murder is Announced. Murgatroyd is also a nickname for the vampire in Kim Newman's Anno Dracula. On a more interesting note, in the BBC Radio 4 adaptation of the previously mentioned Agatha Christie book, Alice Arnold was responsible for the role of Miss Murgatroyd. ZUN states that he originally based her off Alice from Megami Tensei and Alice from Asura Blade. Of course, a major inspiration is also the titular protagonist of Lewis Carroll's famous novel Alice's Adventures in Wonderland - the majority of enemies in Mystic Square's Extra Stage are card soldiers of the same type as those in the Walt Disney animated movie version of the novel. 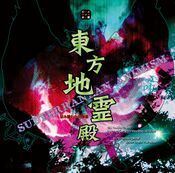 The title of the theme used in that stage also directly translates to "Alice in Wonderland". Alice was first seen in Mystic Square wearing a pink/white dress with a blue apron, a matching headband with a ribbon on the side, as well as white socks. She has blonde hair and gold eyes like in all of her later appearances (except Perfect Cherry Blossom). Since the Extra Stage, she carries her signature grimoire. In Perfect Cherry Blossom, she has blue eyes and has a red band in her hair. She wears a light blue dress with long white sleeves and two pink ribbons, one going round her neck and another one around her waist. In Immaterial and Missing Power, Alice's sprites show her to have blue eyes, but they're gold in her portraits. Her book is wrapped up in a red ribbon, and she has strings on her fingers to control her dolls. She is also seen wearing black boots. 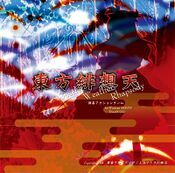 Her sprites in Scarlet Weather Rhapsody and Touhou Hisoutensoku were unchanged. Upon first glance she is said to look like a doll. Her height is stated to be "fairly tall". Alice first appeared in Mystic Square. She showed up in the third stage as a young-looking magician with the title "Girl of Death". She confronted the heroine invading Makai (in fact, she was the first boss the heroine met after entering Makai), but was defeated. She later appeared as "Alice of the Magic Land" in the Extra Stage and fought with five colours: red, blue, purple, green and yellow. In Perfect Cherry Blossom, she did not have any special reason to fight the heorine, and it was only because she was there by chance that she became an opponent. 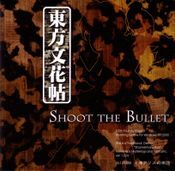 In Shoot the Bullet, Aya Shameimaru encountered Alice on stage 2 and took photos of her danmaku. In Touhou Hisoutensoku she created a giant doll, called the Goliath Doll. Marisa Kirisame noticed a figure in the Forest of Magic and told Cirno about it. Alice then tested it in a battle against Cirno, who thought the giant doll is Daidarabotchi. Alice doesn't actually appear here - it's a pseudo-Alice who was sent by the Giant Catfish to assassinate Hong Meiling in her dreams, but was defeated. Alice made a background cameo appearance in Hopeless Masquerade on the Human Village stage. She is seen at the far right-hand side of the screen standing around. Marisa Kirisame is a fellow magician of the Forest of Magic. They fought each other in Perfect Cherry Blossom and, presumably, Mystic Square. They were partners in Imperishable Night, and she supported Marisa in Subterranean Animism. At the end of Mystic Square, Mima takes Alice as her maid, releasing her some time later. In Strange and Bright Nature Deity, she invited the Three Fairies of Light to her home and gave them tea and cake. She got very angry at Sunny Milk for lying about the grimoire, but calmed down. Alice purchases the Butterfly Dream Pills from Eirin. Alice's sigil in The Grimoire of Marisa. Alice's different color palettes from Touhou Hisoutensoku. The middle right corresponds to her Immaterial and Missing Power second color palette, while the bottom left corresponds to her Scarlet Weather Rhapsody palette. 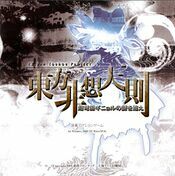 「スペクトルミステリー」 Spectrum Mystery IN Familiar:「上海人形」"Shanghai Doll"
Alice appeared on the cover of Mystic Square with a cat. Alice appeared in the Music Room background of Perfect Cherry Blossom. Being known as the "Seven-Colored Puppeteer" or "Rainbow Puppeteer", Alice apparently believes in a correlation between color and power level. During her dialogue with Reimu Hakurei in Perfect Cherry Blossom, she asserts Reimu's powers are only equal to 28.5714% (or 2/7) of her own powers, due to Reimu's outfit only consisting of two colors. This appears to be a recurring theme in Perfect Cherry Blossom, as Yukari Yakumo, Ran Yakumo and Chen are all named after colors and have relative power levels equivalent to their colors' place on the visual spectrum. This, however, has not been referenced in recent games. Alice's alternate palette from Scarlet Weather Rhapsody resembles Hina-Ichigo, a doll from the manga series Rozen Maiden. In Touhou Hisoutensoku, she has palettes resembling the other Rozen Maiden dolls: Suiseiseki, Souseiseki, Suigintou, Shinku, Kanaria, and Kirakishou. Add the fact that, in Rozen Maiden, the aforementioned dolls are battling for the title of "Alice", the perfect doll. 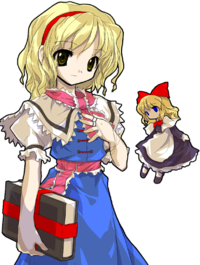 Alice is one of the two characters in the whole series who appears 3 times in a single stage: Twice as a midboss and the third as the actual boss of stage 3 in Perfect Cherry Blossom. The other is Seiran in Legacy of Lunatic Kingdom. Alice is one of the four characters in the whole series who appears as a boss two times in different stages of the same game - as the third and extra boss in Mystic Square. The others are Rika in Story of Eastern Wonderland, Yuuka Kazami in Lotus Land Story and Junko in Legacy of Lunatic Kingdom. Alice has been a recurring customer of Eirin's, coming to see her to buy a medicine called the Butterfly Dream Pill. Yuki and Mai's second attack in Samidare looks very similar to Alice's second attack in the Extra Stage of Mystic Square. The stage 3 boss, kinda ordinary magician. Mainly she possess the ability to handle magic. She is a versatile magician, that has no specific strong or weak point in any area. If you ask me, she is similar to Marisa, or rather I'd say a youkai version of Marisa. Alice has an obsession with collecting things as well, and has the habit of collecting magic items, especially magic books. As they both share the same hobby, she often clashes with Marisa so their relation is like loggerheads. Most recently, she is interested in collecting dolls that have a story associated with them. She had no evident reason to attack Reimu and company. They were chosen for the target of her magic because they were there. Dominating the enemy with overwhelming power is not fun at all for Alice, so she always sees her opponent's reaction and tries to fight with power that exceeds the opponent by a hair. Even if she loses, she doesn't show her full power. That's because she thinks it would be the end of the rope for her if she lost with full power. In this aspect, her personality is somewhat similar to Reimu. A pure magician. While her appearance is almost identical to humans, she is not one. Her house is crammed with a lot of dolls. The sight is so spooky that it scares rare visitors away. The house of dolls is strangest even in the forest of the bizarre. It's no wonder that they tend to run away from there. Her personality is indifferent to others, and is easily attached to magic. She puts on a confident attitude, but she actually also has a timid side. She is quite average in melee fighting. Both her body movement and magic using are average. Instead of that she has very high skillfulness, which enables her to control many dolls as if they're living beings. This skillfulness is among the finest among all of Gensokyo. A magician living in the Forest of Magic. She possess the ability to use magic. Puppetry is a type of magic too. She rarely goes out by herself, but she had no other choice this time. She has many similarities to Marisa, namely living in the Forest of Magic, being a magician and having an obsession with collecting things. However, they have an absolute difference in that Alice is a magician as a species while Marisa is a human magician. Other than that, they're also different in using forest's mushroom as preference or not. Of course, Alice is the one not using them. However, it is not because of such matter that makes both on bad terms. Magic is her weapon. A magician's magic is always originally developed by the magician. She teams with Marisa this time. Her laser penetrates and lasts as long as the player wishes, so it's unexpectedly strong. Good against both bosses and weaklings. It's her doll that is shooting the laser though. Recommended for those who want to be done quickly. The greatest difference between Alice and Marisa is that Marisa is a human of magician occupation whereas Alice is a magician as a species. You might imagine magicians as being indoor-type people; in Alice's case, you'd be right. She spends most of her time alone, and the forest is a good place for that. The forest is quite humid, however, and her dolls will become damaged without her constant care. Because of this, she's currently planning to make a doll that will automatically take care of other dolls. A puppeteer that lives in the forest. She felt something odd about the geyser that erupted, but since youkai prefer not to go underground she worried over what to do. That's when she noticed that Marisa was especially interested in the geyser, so she convinced Marisa to investigate the underground for her. She told her that investigating the hot spring would be a fun game, and pointed her towards the source of the geyser. She also made her carry dolls that had Yukari's remote control devices in them. This page was last edited on 4 March 2019, at 16:44.